Douglas is one of the most inventive writers I have ever read, toying with the lines between experimental form and accessibility. The poems are visceral and raw; all the while challenging what poetry can be and do. An unwavering exploration of family, trauma, body, and identity, Natalie’s work is a masterpiece. This book’s bravery taught me how to look at my identity full-on, with pride, and not shrink away. What a revolution, to be joyous when the world insists on so much violence, trauma, and despair. Aimee insists on wonder—and not in a naïve way, but a complicated wonder side-by-side teeth and a strong bite. In Aimee’s work, we are encouraged to play, to never give up light and hope. Grief is not a thing to fear in Franny’s work, but an old friend. Franny teaches us how to deal with loss with dignity, how to hold your head high in the face of death and continue existing. This is a gorgeous collection that houses two of my favorite poems ever—“Delores Jepps” and “The Last Poem About Race.” Tim’s work is alight with tenderness, each of these poems read as an ode, as lovesongs to the world. 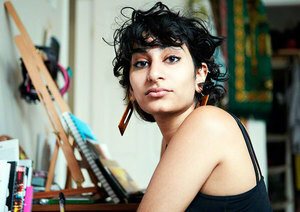 Fatimah Asghar is a nationally touring poet, photographer and performer. Her work has appeared in many journals including POETRY Magazine, The Margins, and Gulf Coast. She is a Kundiman Fellow and a member of the Dark Noise Collective.